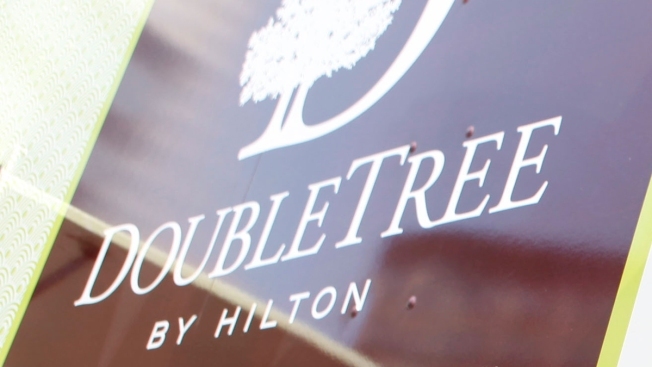 "It is never ok to discriminate against guests for the color of their skin"
DoubleTree by Hilton's logo as seen in this May 26, 2011, file photo. A black hotel guest says he was "racially profiled" at a Hilton Hotel in Oregon and asked to leave the property by police for trespassing. Jermaine Massey described his experience with a hotel staffer named Earl on Instagram and Facebook. He says the trouble began as he spoke to his mother on his phone in the hotel lobby and hotel staff called the police on him. Massey wrote, "the exact reason is still unclear to me." Massey posted a second post and series of videos that appear to show a portion of his encounter with police at the hotel. In the video, an officer is heard saying, "Earl is in control of the property… If he says you gotta leave, you gotta leave." Portland Police Bureau spokesman Sgt. Chris Burley confirmed an officer arrived at the DoubleTree Lloyd Center in Portland after hotel employees contacted police regarding trespassing. Burley said that the man gathered his items and left. Before he left, police offered assistance to a new hotel, which he declined. Social media reaction posts began surfacing with the hashtag #HotelEarl. Over the past year, hashtags have emerged following other reported incidents of black people being racially profiled, such as #LivingWhileBlack, #BBQBecky, #CornerstoreCaroline, #PermitPatty and #PoolPassPete. Videos have documented black people harassed as they golf, eat, nap and swim. "It is never ok to discriminate against guests for the color of their skin and to prejudge them based on your own bias against that race," Massey wrote on Instagram following the ordeal. "Safety and security of our guests and associates is our top priority at the Doubletree by Hilton Portland. This unfortunate incident is likely the result of a misunderstanding between our hotel and guest. We are sorry that this matter ended the way it did. We are place of public accommodation and do not discriminate against any individuals or groups. We have reached out to the guest in order to resolve this matter. I look forward to speaking with Mr. Massey today and resolving this issue directly with him." Massey could not immediately be reached for comment.